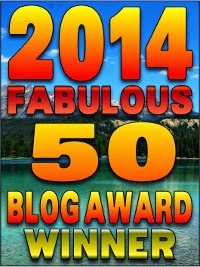 So we're more than pleased to announce the winners of the 2014 Fabulous 50 Blog Awards, the most prestigious new media awards in the conservative blogosphere. BadBlue: An automated, always-current news portal sourced via social network "buzz"
Ezra Klein, a legal "expert who doesn't know how laws work"
Paul Krugman for "Krugman vs. Krugman on Carbon Taxes"
Update: Thanks to Andrea Shea King (the famed "Radio Patriot") for her coverage of the Fab 50 Awards in Worldnet Daily. What about " mememine69 "? OMG, thank you for the honor yet again, Doug - you are too kind. Now where's my blog award badge? Never mind - I see it now. You are AWESOME. Oh wow, thank you Doug. What a nice award. You made my day, no my week, no my month. I love the awards for faux conservatism and economedian - a good laugh. The highest Sara Noble award is to invite someone to a BBQ at my house - if you lived here, I'd invite you to a BBQ. Only select people get that invitation. If you are ever on LI, you're invited! It's hard to do this blogging at times - it's time consuming and there are the enemies out there - but this helps encourage me. HEY!!! HOW COME MY BLOG DIDN'T WIN?!! oh wait, I don't have a blog... nevermind. Carry On. I'd like to thank all the bigger people. Zero Hedge deserves a spot. OMG, once again I have no prepared remarks. And Big Guy has our teleprompter. So, I'll just say THANK YOU SOOOOOOOOO Much!!!! Hi. I hope you can start following refugeeresettlementwatch.org blog by Ann Corcoran. She is simply the best investigative blogger regarding the corruption/scam going on with mass immigration via Office of Refugee Resettlement and the State dept. The number of third worlders being brought in is being ramped up. The billions being given to non profits who call themselves charities but are really government contractors is outrageous. Anyhoo, in my own research I discovered her and highly recommend a view. Also Pamela Geller is excellent. So many blogs, so little time!! Thx. Muchas Garcias, Doug! Angry White Dude is thrilled to have been included in the list! Somewhere, I believe Andrew Dice Clay is weeping in joy. The same names as last year. Where is Young Cons? IJReview? Top Right News? No one reads RedState anymore, and RightWingNews is basically just a clip-and-post site, with little actual commentary. Oh come on! Where is The Federalist? Seriously, Mollie Hemingway, anyone? Hello? Hello? Yeah, the 2014 LGF Awards are coming up, and you're in the running just because of this. Thanks Doug. Appreciate the sentiment. Not too many of us libertarians on the entrepreneurship beat, but we are growing. @pointsnfigures Also posting on Tumblr at pointsnandfigures.com. Don't set up a Tumblr account after a few bourbon's. You like me ... you really like me! (well, I laughed anyway ...). Not unfair to Paul Gigot - just watch the weekly Fox News WSJ program moderated by Paul Gigot. The WSJ editorial page has become considerably less of a conservative voice then it was under it's former editor Robert Bartley (deceased). The WSJ op-ed page has become consistent Tea Party bashers, pro-amnesty and in favor of all things crony capitalist. See the negative coverage they give conservative/Tea Party Republicans vs. Establishment Republicans. I cancelled my subscription to the WSJ several years ago. Great choices, but I agree with Ari Sens, next year you need to find a spot for Mollie Hemingway and The Federalist. Did everyone win a prize? I am so excited. I can't wait to post my loser badge of honor. You humble me. "The Religion of Peace" makes a huge contribution to the defense of civilization. Are these the people Obama will be rounding up? Along with commenters he doesn't like? YES, I WILL SAY IT: Merry Christmas, Everyone! Who is On the Obama Enemies List? I Really, Really Want to See "The Interview"
Why don't you ask him about torture?